This Thanksgiving holiday, give more thanks and wishes for your loved ones by customizing some happy Thanksgiving greeting cards for them. 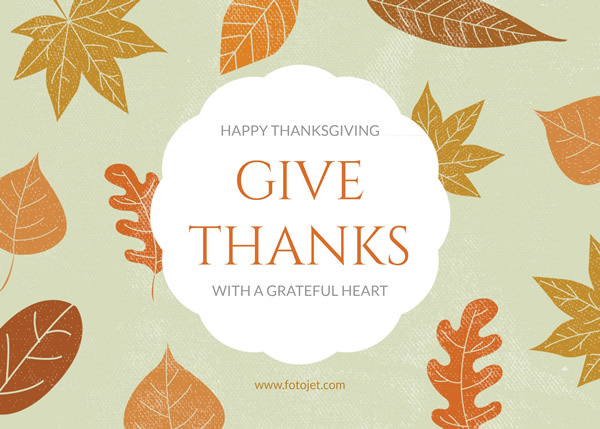 And there is no need to worry about your poor design skills, since the Thanksgiving card maker FotoJet provides delicate templates and easy-to-use editing tools that enable users to design pro-looking Thanksgiving cards in minutes. This stunning Thanksgiving card template is ready to be sent to deliver your sincere wishes. You can also give more embellishments on it to suit your personal styles.